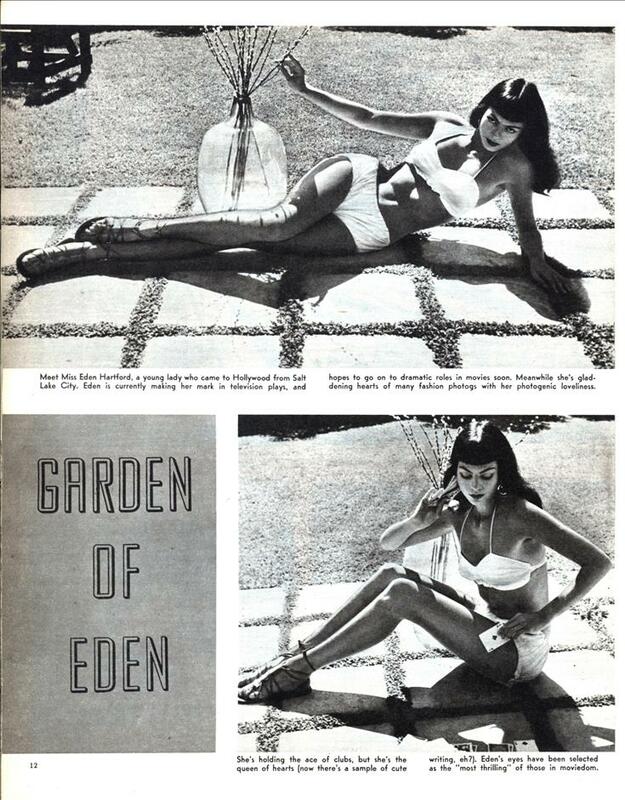 Because Eden was so photogenic, she became the most sought-after model at the Fred Archer School of Photography in California. Our heroine progressed from there to fashion and commercial photography and is currently winning a growing group of fans by appearing on television shows. Asked, “Do you want to get into the movies?” Miss Hartford has the right answer. “What girl doesn’t?” is her fitting reply. Eden came to Hollywood from Salt Lake City. She’s really a designing woman—in an artistic sense, we hasten to add—and she is quite talented at making her own wardrobe, painting, interior decoration and the allied arts. Her ambition? Well, besides her career in video and the movies, she’d like to be a dress designer. But if Eden did want to be a “designing woman'” in the other sense, she’s well-equipped for that too. as these pictures prove. A slender girl, she is five feet seven inches tall and weighs 126. Her measurements are 36-25-35, practically perfect for modeling. Eden lias the features of a high fashion model too. She wears her silky black hair in a page-hoy bob and is one of the few women in Hollywood who looks good with “doe eyes.”‘ Those eyes, incidentally, have been called the “most thrilling” in the film capital, a verdict with which we would not be disposed to argue. High cheek hones, beautiful lips and a whimsical, pixie-like smile complete Eden’s equipment for success on stage, screen or television. Anything else you’d like to know about the enchanting Miss Hartford? If that old Chinese proverb about one picture being worth a thousand words is correct, we need write nothing more! I always did admire that man. Apparently her sister, Dee Hartford, was more successful as an actress, appearing on episodes of Lost in Space and The Time Tunnel, among other things.